2014 has been a great year for guitarists. Guitar pedal makers have been creating some amazing pedals and the quality has never been so high. Advances in technology are opening up new avenues to guitarists which weren’t available before. This short post will go through what I feel are some of the best pedals I have enjoyed playing in 2014. 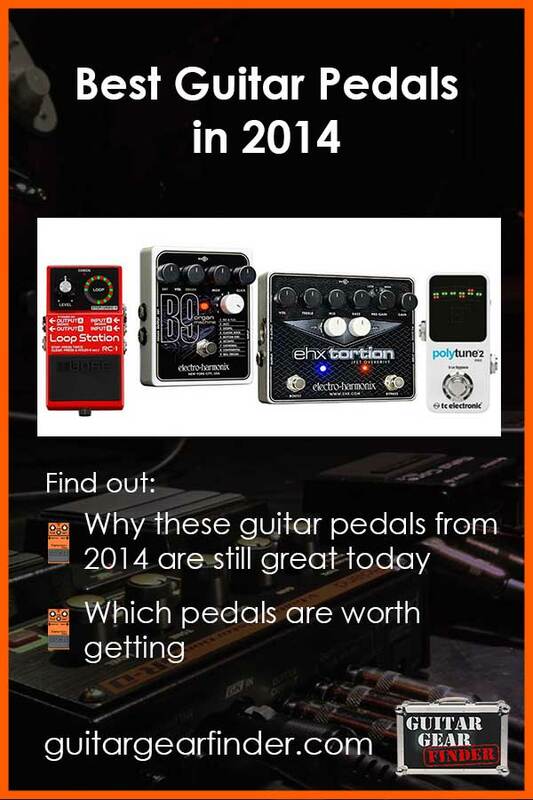 Of course there are a lot of other great pedals that came out in 2014 that aren’t in this list. This list showcases the pedals my students and I have enjoyed the most this year. The Ditto Looper by TC Electronic (read my review of the Ditto here) has been incredibly popular due to its tiny form factor and excellent quality. It’s simple to use and does the job well for most situations. BOSS already have a great range of looper pedals (read my review of the RC-30 here), but nothing as simple and small as the Ditto. The RC-1 fills that hole. Of course, it doesn’t have the flexibility available with their higher range Loop Station pedals, but that’s not the goal of the RC-1. The RC-1 is designed to give guitarists a simple looper pedal without having to dedicate half their pedalboard to have that ability. Check out the RC-1 in use below to get a quick idea of what it is capable of. 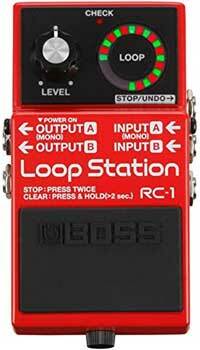 As a guitar teacher I highly recommend every guitarist own a looper pedal. Which looper pedal you choose depends on what features you want. If you want simplicity at a decent price with stereo support, then the RC-1 is worth considering. Check out the current price and details of the RC-1 here. Some distortion/overdrive pedals have a specific goal. For example, when you buy a Big Muff Pi (read my review of the Nano Big Muff Pi here) you’re getting one thing and you know how it should sound. Some distortion pedals offer some flexibility and allow you to customize your tone. I have never come across a pedal that comes close to the flexibility the EHX Tortion offers. It’s incredibly flexible and I’ve never had so much fun with a distortion pedal. 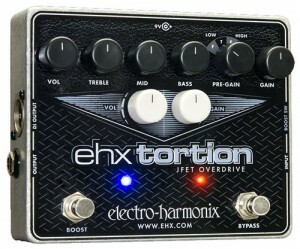 You can find out how flexible it is in my extensive review of the EHX Tortion here. At the moment until something else comes along, the EHX Tortion is the best distortion/overdrive pedal available in my opinion. I’m sure there are plenty of people who prefer spending $2000+ on a used Klon Centaur, but as far as I’m concerned, the best pedal is one that you can adjust to create your own unique tone and that’s best done with the EHX Tortion. If you had to limit yourself to only one distortion/overdrive pedal, I highly recommend the EHX Tortion. 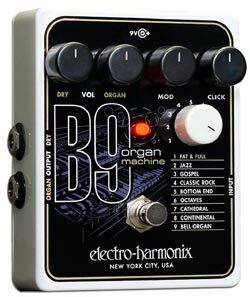 When I first heard about the B9 Organ Machine (read my full review here), I assumed it would be yet another gimmicky pedal that doesn’t sound anything like the instrument it is trying to match. I was blown away when I tried the B9 out and I’m sure I had a stupid grin on my face the whole time. There aren’t many pedals I would claim are fun to play, but the B9 is definitely fun. How much use you get out of the B9 depends on what styles you enjoy, but even if you don’t usually play music that makes use of an organ, it’s great fun to use. Rather than upgrade a delay pedal or buy yet another overdrive pedal which will give you more of what you already have, consider getting a pedal like the B9 to bring a new type of experience to your playing. Mini pedals seem to be all the rage at the moment and in many ways, it’s a good trend. Smaller pedals mean you can fit more on your pedalboard or have a smaller pedalboard. Seeing a Big Muff Pi sitting next to the Nano Big Muff Pi is laughable when you consider they do the same exact job. The type of pedal that I welcome in a mini size is a tuner pedal. That type of pedal is so useful, but as it doesn’t (or shouldn’t) affect your tone, it shouldn’t really take up much pedal space. The Polytune 2 Mini is a nifty little pedal that carries over the polyphonic tuning that made the original Polytune such a hit. It has a nice bright display and is so intuitive. 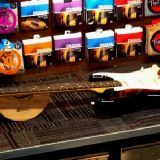 Simply strum all strings and you can instantly see which strings need to be adjusted. Once you try this tuner out you’ll realize how backwards standard tuners are. 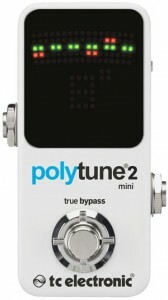 If you don’t have a tuner already, I would recommend the Polytune 2 Mini. The Flashback and the Flashback X4 are excellent delay pedals and have been very popular for quite a few reasons. I was surprised when TC Electronic released the Flashback Mini as it just seems to provide a watered down version of the Flashback at a smaller size. What I realized is that the Flashback Mini is for a different type of guitarist. 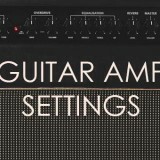 Some guitarists need a lot of different types of delay effects and settings readily available for different songs or styles. For those guitarists the Flashback or the X4 are perfect. On the other hand, there are guitarists who need a good quality delay but they don’t need instant access to a wide range of delay styles. If that sounds like you, then the Flashback Mini might suit you best. 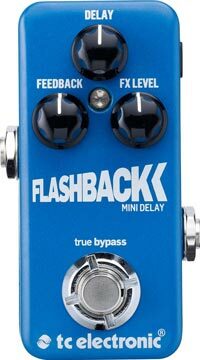 One of my students bought the Flashback Mini because he wanted something small, cheap and simple. That’s exactly what the Mini offers. The bonus feature that separates this from other simple delay pedals is their TonePrint Editor. You can customize your own presets and send them to your pedal. That gives you a lot of flexibility and accuracy (eg: setting a delay to an exact speed) which overcomes the pedal’s simplicity. My student’s favorite feature is the free smartphone app Editor. You customize your tone and hold your smartphone over your pickup and it wirelessly transfers your preset to the pedal without needing to connect it or stress about Bluetooth. 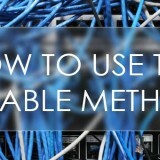 When I first saw this, it made me want to throw out my USB cables. If you already have a decent delay pedal, this would not be an upgrade. But if you don’t yet have a delay, this is an excellent choice thanks to it’s simplicity. If you’re interested in getting a Flashback pedal, check out this guide to compare the different options in the Flashback range. There’s a big difference between the pedals in the Flashback range, so you’re likely to find one of them suits you more than the others. There have been a lot of other pedals in 2014 and many I’ve reviewed, but these pedals stood out in one way or another. I feel these are the best guitar pedals in 2014 because these pedals added the most to my playing or my student’s enjoyment of guitar. If you don’t have any of the above pedals, I would suggest checking out the one that interests you the most because you might find it gives you a new spark of inspiration (not the tuner of course!). Found this guide useful? Please share it on social media to help support this site (if you use Pinterest, please pin the below photo). Aaron Matthies is a guitar teacher living in Australia. 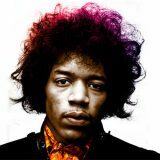 This website is his way of providing gear reviews, guides and lessons to guitarists around the world.